When it comes to making games in two-dimensional space you may find yourself limited by what you can create given the built-in API. This article aims to go over a few different methods for 2D collision detection. Since this article has more than one method there are different prerequisites depending on the way you intend to approach the problem of collision detection. For the first method you will need a basic understanding of how GUI elements are positioned and their properties. The second method will require knowledge of the dot product and how to rotate vectors/points in 2D (rotation is covered in this article). 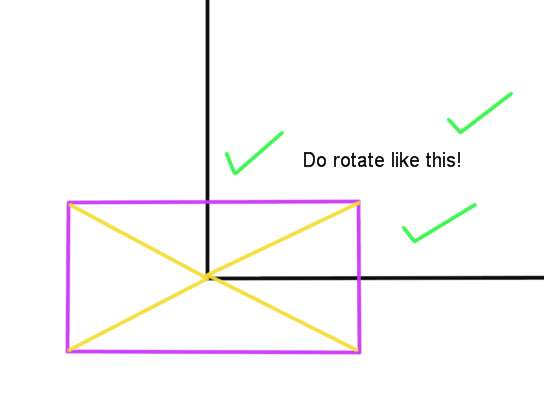 An “Axis-aligned shape” is a non-rotated shape. In other words, its edges are parallel to the standard x and y axes. This means that this form of collision detection only works for GUI elements that have their rotation property set to zero. The goal of this method of collision is to see if the extents of each shape overlap each other. What set of rules can we come up with to check if the shape 1 and shape 2 overlap? If the x-value of the top-left corner of the first shape is less than the x-value of the top-right corner of the second shape. If the x-value of the top-right corner of the first shape is greater than the x-value of the top-left corner of the second shape. If the y-value of the top-left corner of the first shape is less than the y-value of the bottom-left corner of the second shape. If the y-value of the bottom-left corner of the first shape is greater than the y-value of the top-left corner of the second shape. It is encouraged that you use the above picture along with the rules (and potentially your fingers!) to draw out why this works. Alright, so we have the theory behind this simple collision method. How do we translate it over to code? Well doing the test is pretty simple once we have the corners, so how do we get the corners? In this tutorial we will be using the AbsolutePosition and AbsoluteSize properties as they take our GUI’s size and position and convert it entirely into pixels. We can’t use a combination of scale and offset as they are two different units and therefore cannot be compared. If we wanted to have our script automatically reposition the shapes then we would be looking for the minimum amount that we would have to move our shapes to have them no longer collide. This amount is called the minimum translation vector (MTV) and it’s pretty useful! Calculating it for axis-aligned shapes is a pretty straight-forward logically. We simply want to look at each edge of shape1, get the distance between that edge and shape2’s opposite edge, and then out of all those comparisons we want to find the smallest distance and move our shape. Right, so this is where things get a bit more complicated. In the previous method we were only able to detect collision when the shapes were not rotated. With the next method we will be able to detect collision between rotated shapes, but only if we have their rotated corners! The size and position of a GUI object remain the same regardless of the rotation of a shape. This means the shape still positions itself from the top-left corner as if no-rotation was applied. Similarly the position properties of the shape will provide a non-rotated value. When a shape is rotated it does so via the center of the shape. This means we have an origin of rotation. Remember SOHCAHTOA We can use this for right angle triangles to solve for either a missing angle or length as long as we have at least two pieces of information. We know that the new x-value (Xb) on our rotated axis is just the summation of length A to B (AB) + length B to Xb (BXb). We also know that length B to Xb is the same length as Xa to D (XaD). Similarly we know that the new y-value (Yb) on our rotated axis is just the length of A to F (AF) - length Yb to F (YbF). We also know that length Yb to F is the same length as G to Ya (GYa). Alright, now we have to find a way to apply this new found knowledge to GUI. The first problem we have is that the equation we just derived is limited to rotating around an origin point of (0, 0). This isn’t a huge problem but we need to think about our information in its current form. Then once we’ve rotated those adjusted corners we do some addition to get the points relative to the real center of the shape again. One final important thing to remember is that positive x and y values in vector2 reference a point in the top right quadrant. Positive x and y values for UDim2 positions on the other hand references points in the bottom right quadrant. Because we are rotating vector2 values we might think that we want to rotate clockwise. However, because we are translating those points into UDim2 we actually want to rotate counter-clockwise to get the proper UDim2 values. Awesome we can get the rotated corners of our shapes! Now that we have a way to get the corners of a shape we can approach some more advanced methods for 2D collision. Separating axis theorem is a method that can check if two convex polygons are intersecting. A convex polygon is simply any shape that you can draw any line through and it will only cross the shape twice. For our sake we are only using rectangles, which are convex shapes. The idea behind SAT is that if you can draw a line between the two shapes then there isn’t collision. The premise is simple enough that anyone can do it pretty easily by hand, but how do we translate this over to something we can test mathematically? The answer is to project our corners onto all unique surface normals of our two shapes. If we know where the blue lines and red lines lie along pinkish-purple line, then we just have to see if those points overlap with each other. If they don’t we know there’s no intersection. If they do then we have to check the other axes. Now obviously in the above example we’re looking at the shadows cast from every angle around the two shapes. Not only is that inefficient, it’s also unnecessary. As mentioned above we only need to cast shadows on the unique surface normals of our shapes. Awesome! Now that the axes are out of the way it’s time to focus on projections. So in in order to get the corners projected onto our axis we simply loop through and project with the dot product. One thing we have to be careful of, is to keep this value in scalar form. If we were to convert this into a vector then our only measure of length would be magnitude, but magnitude is always positive and that means we lose valuable information when checking if these values overlap. So we want to get the largest and smallest scalars of each of our shape (since together they represent the end points of the shape’s “shadow”) and then see if they overlap. If there are any gaps we instantly know the shapes do not collide. However, if there are no gaps and we’ve checked the overlapping scalars on all axis then we know the two shapes are colliding! -- if they don't overlap then no collision! Once again, we may want our shapes to automatically readjust their position if there is collision. We can also calculate the MTV with SAT collisions. The process is actually even easier than axis-aligned shapes because we have most of the information already. Alright, this last algorithm is more or less supplementary as it’s not exactly ideal for the purposes of collision alone, but if you working in 2D you may find it useful to use with the other methods discussed for a bit more information about a shape’s surroundings. Now if these two line segments do in fact intersect then we know that that there are some scalars, t and u, that when multiplied against r and s respectively equal to each other: That is our intersection point. -- You might notice that this is actually just the z-value of what we would get if crossed these two vectors as 3D vectors. One interesting propery of this that we want to take note of is that when we 2D cross any vector with itself the result is 0. So, with this in mind we know that if we run this calculation and t and u are both between 0 and 1 (since we’d multiply it by our additive vectors) then we know the two lines intersect! That’s all there is to it! Awesome, now it’s just a matter of applying this to our code. Luckily we have the corners figured out already so it’s just a matter of comparing the line-segments that make up two shapes. You might notice that this method is lacking when one shape is larger than the other due to their edges not colliding, hence why it’s not exactly optimal as a collision method. That being said, it’s not impossible to adjust this method to fix this problem, but that will not be covered in this article.